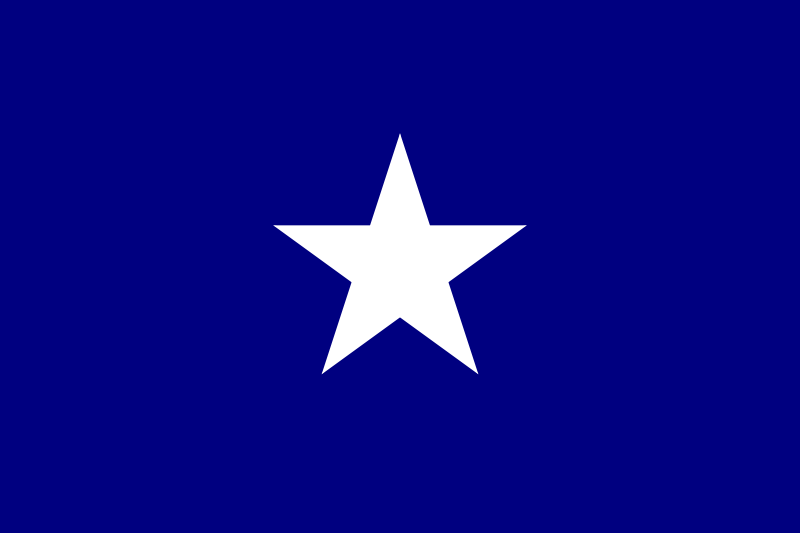 The Bonnie Blue Flag, a single white star on a blue field, was the flag of the short-lived Republic of West Florida. It was created by Melissa Johnson, sister-in-law of Major Isaac Johnson, commander of the West Florida Dragoons. In September 1810, settlers in the Spanish territory of West Florida revolted against the Spanish government and proclaimed an independent republic. The Bonnie Blue Flag was raised at the Spanish fort in Baton Rouge on September 23, 1810. On December 6, 1810, West Florida was annexed by the United States and the republic ceased to exist, after a life of 74 days. In addition to the national flags, a wide variety of flags and banners were flown by Southerners during the War. Most famously, the "Bonnie Blue Flag" was used as an unofficial flag during the early months of 1861. It was flying above the Confederate batteries that first opened fire on Fort Sumter. The first official flag of the Confederacy, called the "Stars and Bars," was flown from March 5, 1861, to May 26, 1863. The very first national flag of the Confederacy was designed by Prussian artist Nicola Marschall in Marion, Alabama. The Stars and Bars flag was adopted March 4, 1861 in Montgomery, Alabama and raised over the dome of that first Confederate Capitol. Marschall also designed the Confederate uniform. One of the first acts of the Provisional Confederate Congress was to create the Committee on the Flag and Seal, chaired by William Porcher Miles of South Carolina. The committee asked the public to submit thoughts and ideas on the topic and was, as historian John M. Coski puts it, "overwhelmed by requests not to abandon the 'old flag' of the United States." Miles had already designed a flag that would later become the Confederate battle flag, and he favored his flag over the "Stars and Bars" proposal. But given the popular support for a flag similar to the U.S. flag ("the Stars and Stripes"), the Stars and Bars design was approved by the committee. When war broke out, the Stars and Bars caused confusion on the battlefield because of its similarity to the U.S. flag of the U.S. Army. Eventually, a total of thirteen stars would be shown on the flag, reflecting the Confederacy's claims to have admitted Kentucky and Missouri into their union. The first public appearance of the 13-star flag was outside the Ben Johnson House in Bardstown, Kentucky. The 13-star design was also used as the basis of a naval ensign. During the solicitation for the second national flag, there were many different types of designs that were proposed, nearly all making use of the battle flag, which by 1863 had become well-known and popular. 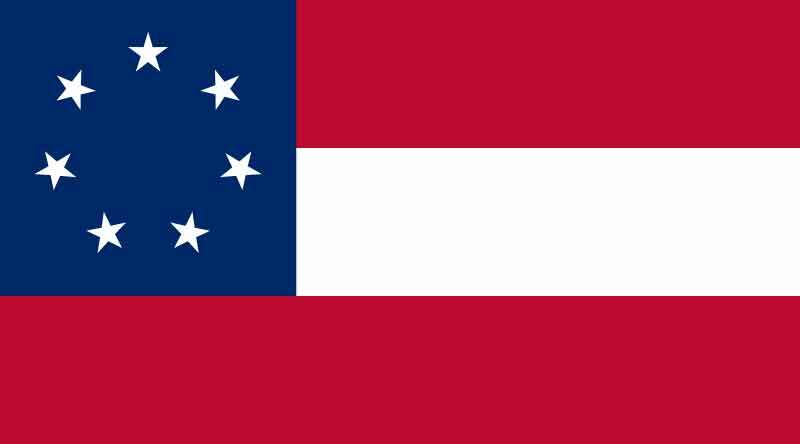 The new design was specified by the Confederate Congress to be a white field "with the union (now used as the battle flag) to be a square of two-thirds the width of the flag, having the ground red; thereupon a broad saltier [sic] of blue, bordered with white, and emblazoned with mullets or five-pointed stars, corresponding in number to that of the Confederate States." The nickname "stainless" referred to the pure white field. The flag act of 1864 did not state what the white symbolized and advocates offered various interpretations. The most common interpretation is that the white field symbolized the purity of the Cause. The Confederate Congress debated whether the white field should have a blue stripe and whether it should be bordered in red. William Miles delivered a speech for the simple white design that was eventually approved. He argued that the battle flag must be used, but for a national flag it was necessary to emblazon it, but as simply as possible, with a plain white field. Initial reaction to the second national flag was favorable, but over time it became criticized for being "too white". The Columbia Daily South Carolinian observed that it was essentially a battle flag upon a flag of truce and might send a mixed message. Military officers voiced complaints about the flag being too white, for various reasons, including the danger of being mistaken as a flag of truce, especially on naval ships, and that it was too easily soiled. 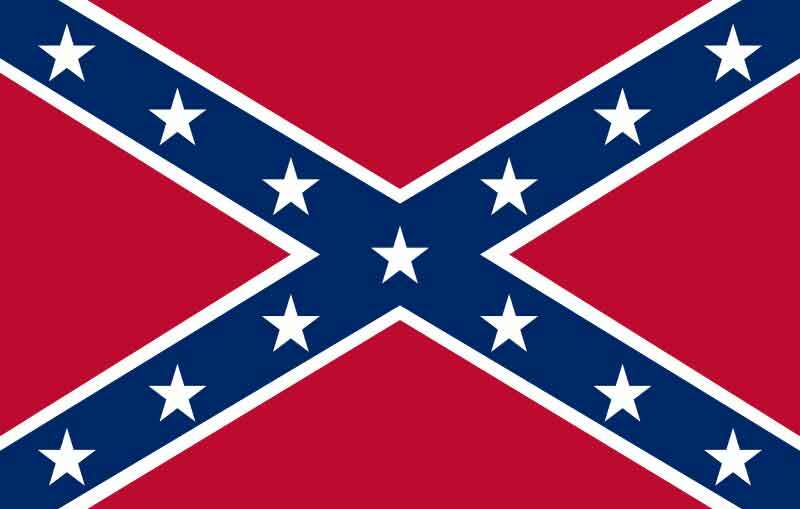 This flag is nonetheless a historical symbol of the civil war. The third national flag was adopted March 4, 1865, just before the fall of the Confederacy. The red vertical stripe was proposed by Major Arthur L. Rogers, who argued that the pure white field of the second national flag could be mistaken as a flag of truce. When hanging limp in no wind, the flag's Southern Cross canton could accidentally stay hidden, so the flag could mistakenly appear all white. Rogers lobbied successfully to have this alteraton introduced in the Confederate Senate. He defended his redesign as having "as little as possible of the Yankee blue", and described it as symbolizing the primary origins of the people of the South, with the cross of Britain and the red bar from the flag of France. The Flag Act of 1865 describes the flag in the following language: "The Congress of the Confederate States of America do enact, That the flag of the Confederate States shall be as follows: The width two-thirds of its length, with the union (now used as the battle flag) to be in width three-fifths of the width of the flag, and so proportioned as to leave the length of the field on the side of the union twice the width of the field below it; to have the ground red and a broad blue saltire thereon, bordered with white and emblazoned with five pointed stars, corresponding in number to that of the Confederate States; the field to be white, except the outer half from the union to be a red bar extending the width of the flag." 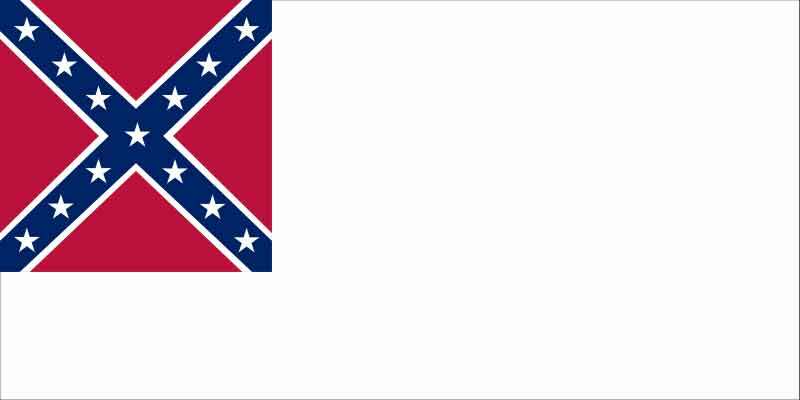 Often referred to as "The" battle flag of the Confederacy it was the design that was the basis of more than 180 separate Confederate military battle flags. 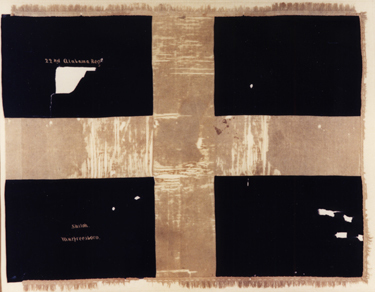 The Army of Northern Virginia battle flag was usually square, of various sizes for the different branches of the service: 48 inches square for the infantry, 36 inches for the artillery, and 30 inches for the cavalry. It was used in battle beginning in December 1861 until the fall of the Confederacy. The blue color on the saltire in the battle flag was navy blue, as opposed to the much lighter blue of the Naval Jack. The flag's stars represented the number of states in the Confederacy. The distance between the stars decreased as the number of states increased, reaching thirteen when the secessionist factions of Missouri and Kentucky joined in late 1861. At the First Battle of Manassas, the similarity between the Stars and Bars and the Stars and Stripes caused confusion and military problems. Regiments carried flags to help commanders observe and assess battles in the warfare of the era. At a distance, the two national flags were hard to tell apart. In addition, Confederate regiments carried many other flags, which added to the possibility of confusion. After the battle, General P.G.T. Beauregard wrote that he was "resolved then to have [our flag] changed if possible, or to adopt for my command a 'Battle flag', which would be Entirely different from any State or Federal flag. "He turned to his aide, who happened to be William Porcher Miles, the former chair of Committee on the Flag and Seal. Miles described his rejected national flag design to Beauregard. Miles also told the Committee on the Flag and Seal about the general's complaints and request for the national flag to be changed. The committee rejected this idea by a four to one vote, after which Beauregard proposed the idea of having two flags. He described the idea in a letter to his commander General Joseph E. Johnston: "I wrote to [Miles] that we should have two flags — a peace or parade flag, and a war flag to be used only on the field of battle — but congress having adjourned no action will be taken on the matter — How would it do us to address the War Dept. on the subject of Regimental or badge flags made of red with two blue bars crossing each other diagonally on which shall be introduced the stars, ... We would then on the field of battle know our friends from our Enemies." 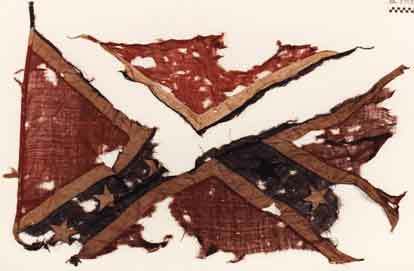 The flag that Miles had favored when he was chair of the Committee on the Flag and Seal eventually became the battle flag and, ultimately, the most popular flag of the Confederacy. According to historian John Coski, Miles' design was inspired by one of the many "secessionist flags" flown at the South Carolina secession convention of December, 1860. That flag was a blue St George's Cross (an upright or Latin cross) on a red field, with 15 white stars on the cross, representing the slave states, and, on the red field, palmetto and crescent symbols. Miles received a variety of feedback on this design, including a critique from Charles Moise, a self-described "Southerner of Jewish persuasion". Moise liked the design, but asked that "the symbol of a particular religion not be made the symbol of the nation." Taking this into account, Miles changed his flag, removing the palmetto and crescent, and substituting a heraldic saltire ("X") for the upright one. The number of stars was changed several times as well. He described these changes and his reasons for making them in early 1861. The diagonal cross was preferable, he wrote, because "it avoided the religious objection about the cross (from the Jews and many Protestant sects), because it did not stand out so conspicuously as if the cross had been placed upright thus." He also argued that the diagonal cross was "more Heraldric [sic] than Ecclesiastical, it being the 'saltire' of Heraldry, and significant of strength and progress." A red field with a Saint Andrew's cross of blue edged with white and emblazoned with stars." What is now often called "The Confederate Flag" or "The Confederate Battle Flag" (actually a combination of the battle flag's colors with the second naval jack design), despite its never having historically represented the CSA as a nation, has become a widely recognized symbol of the South. 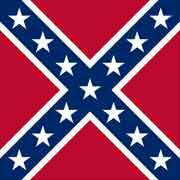 It is also called the "rebel", "Southern Cross, or "Dixie" flag, and is often incorrectly referred to as the "Stars and Bars" (the actual "Stars and Bars" is the First National Flag, which used an entirely different design). During the first half of the 20th century the Confederate flag enjoyed renewed popularity. During World War II some U.S. military units with Southern nicknames, or made up largely of Southerners, made the flag their unofficial emblem. The USS Columbia (CL-56) flew a Confederate Navy Ensign as a battle flag throughout combat in the South Pacific in World War II. This was done in honor of the ship's namesake, the capital city of South Carolina, the first state to secede from the Union. Some soldiers carried Confederate flags into battle. After the Battle of Okinawa a Confederate flag was raised over Shuri Castle by a Marine from the self-styled "Rebel Company" (Company A of the 1st Battalion, 5th Marines). It was visible for miles and was taken down after three days on the orders of General Simon B. Buckner, Jr. (son of Confederate General Simon Buckner), who stated that it was inappropriate as "Americans from all over are involved in this battle". It was replaced with the flag of the United States. Organized in March 1862, this regiment was originally designated as the 26th Alabama Infantry. This designation was later changed to the 50th Alabama Infantry. The date that this flag was issued is unknown, however, its use will post date December 1863 when Joseph E. Johnston assumed command of the Army of Tennessee. Johnston had new battle flags of this pattern issued in the early spring, 1864. Following the war, former Lt. Colonel Newton Nash Clements apparently retained possession of the flag. Dr. Thomas Owen, Director, Alabama Department of Archives and History, began writing Mrs. N. N. Clements concerning the flag on October 22, 1904. Over the years, he continued to request the donation of the flag which was finally forwarded to the Department on August 7, 1909. The flag was donated by Mrs. Clements and her daughter Miss Belle Cements. The accession log entry of August 12, 1909 describes the flag as "badly mutilated". 22ND ALABAMA INFANTRY REGIMENT - ALABAMA DEPARTMENT OF ARCHIVES AND HISTORY , MONTGOMERY, ALABAMA.